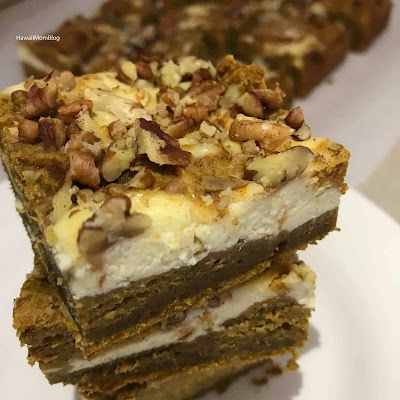 Since I had leftover pumpkin from making these Pumpkin Chocolate Chip Blondies, I decided to make Pumpkin Cheesecake Bars! I love all things cheesecake, and these bars have flavors of fall mixed right in! In a large bowl combine the butter and brown sugar until creamy. Beat in egg and vanilla on high speed. Mix in pumpkin. In a separate bowl, combine the flour, baking soda, cinnamon, pumpkin pie spice, and salt. Mix flour mixture into butter mixture. Spread 2/3 of the batter evenly into the prepared pan. In a medium bowl beat the cream cheese, sugar, egg, and vanilla until smooth and creamy. Drop spoonfuls on top of the pumpkin batter. Drop the remaining pumpkin batter on top of the spoonfuls of cream cheese, and swirl together with a knife. Bake the bars for 35-40 minutes in a 9x13 parchment-line pan at 350 degrees Fahrenheit. You can find the original recipe here on Sally's Baking Addiction.